A3 Size 10.7 x 11.1 in. (186 x 282 mm) 11.7 x 16.5 in. This delicate and extremely intricate mandala was painted by John Miles over a three-year period, and is certainly one of his finest works. He signed and dated this painting in 1980, giving it the provisional title of 'Celtic Renaissance'. This relates to his interest in a collection of ancient Welsh legends known as the Mabinogion that he was absorbed with during these. 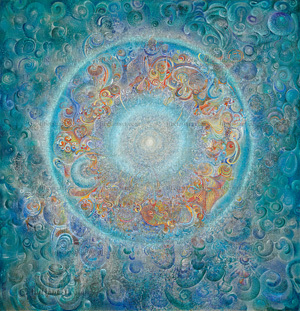 The title of 'Synaesthesia', meaning the 'crossing of the senses', was a prefix that John applied to all his major visionary works, and as a Giclee print in large format size this Mandala image is truly magnificent. Most men sit dully, like sheep in a field, imagining that 'there's nothing to be done', that everyday reality is a kind of prison from which there is no escape except through drugs, drink or suicide. In fact the doors are open. The beginning of his 'salvation' are the glimpses of freedom that come in times of crisis or in moments of sudden ecstasy. I will never give up. I will fight on. I will fight to my last breath. I will try, and paint, and write. I will try to appreciate every moment of my waking consciousness and sleep. I will fight to get amazingly fit - able to walk long distances. Live a full life. Love everything. Never doubt. Never look back in regretfulness. Blake says that the five senses are the five windows that light the caverned man. A realization has come to me that while I was in very good physical health with no heart problems, penetrating into the temple of pure art expression was all but impossible. If anyone had spelled out that at forty-eight I would have a totally wrecked heart and full loss of athletic ability, I would have found it almost impossible to conceive - when as a young man I stormed about the universe almost omnipotent! I realized it when I asked God to pray for me.